EA put together two fake commercials in their real commercial for the game. When did expansion packs die out as a species? Aside from the occasional Blizzard published addon, few bastions of this once staple of video gaming content remain. Now it's all about annual releases and DLC. Luckily for us, EA decided that the future is too important to entrust to a meager DLC download and harken back to the days of expansion packs. 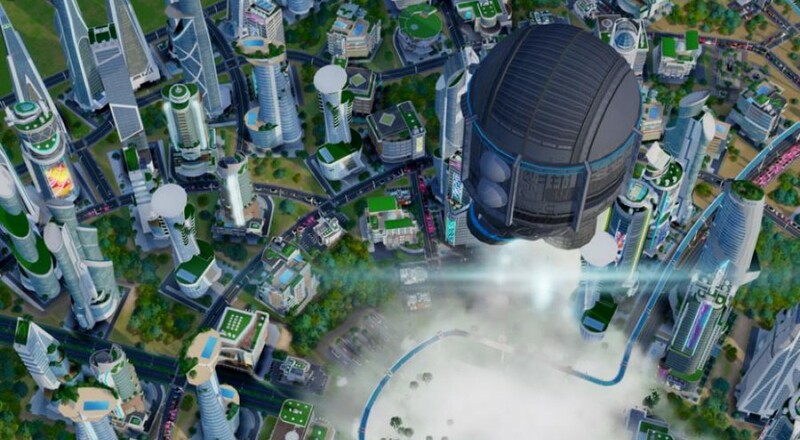 Cities of Tomorrow for SimCity, launching November 12th, teases its upcoming arrival with a cute commercial detailing the two factions at odds in the new game. On one side is the Academy, a bunch of tree hugging high-minded scientists with the goals of ecology and societal equality. They focus on environmentally friendly power and transportation while the citizens live in harmony with nature. All of their buildings look like a bunch of Architects from Dubai were handed a blank check and told to "think beehive meets Nikola Tesla." In the other corner is OmegaCo, who promotes consumerism, robotics, and hedonism of the most grand scale. Nothing but fast food chains and pleasure towers as far as the eye can see. Clearly those guys watched Blade Runner a few dozen times to get their idea of the future. I'm also not sure how trustworthy those gigantic fully powered robots could be. Looks like a bad transistor is all it would take to have that thing level your grotesque city of corporate greed and pollution. I guess you need to keep him around in case Godzilla shows up, though. Maybe this expansion will help heal the issues people harbor against this newest iteration of SimCity. It seems like everybody on the planet is clamoring for bigger cities, yet Maxis ignores their pleas. Perhaps new tech will change their minds. Page created in 0.5191 seconds.